This April Gallery North will host “Resurrection Inventions,” the vivid photography and bold fractal designs of resident artist Anne Prather. The show will run from April 1st through the 30th and include a wide variety of photographic subjects as well as unique and colorful computer-generated two-dimensional artwork. The public is invited to meet the artist and view her extraordinary work at her Artist’s Reception on Saturday, April 6th from 1:00 to 4:00 p.m. Refreshments will be served, and the artist will be on hand to discuss her work and techniques. Anne will also be available for Art Walk Edmonds on Thursday, April 18th from 5:00 to 8:00 p.m.
Anne, who is legally blind, underwent cataract surgery and regained partial vision in one eye. She was then able to see textures and became fascinated with them. This fascination is reflected in her richly textured photographs of mountains, plants, and flowers. Anne’s interest in fractal design came from her career as a botanist and quantitative geneticist. She became intrigued with graphs and fractal images where one shape is repeated infinitely as its size diminishes. “It’s like a spiral in a spiral in a spiral and so on to infinity. 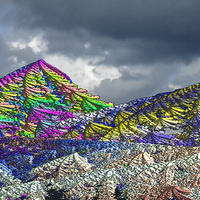 I wanted to know if I could create this type of design using a computer program,” said Anne. Success came with the software Xenodream which Anne uses to produce her stunning fractal images. Anne’s art career was temporarily halted in 2015 as she battled breast cancer. When Anne returned, she discovered the wonder of incorporating her digital fractals into different media. Her work now includes glass paperweights with those designs fixed to base. Anne’s dynamic designs seem to pop out and magically move under the paperweight’s magnifying dome. Gallery North: In operation for more than 55 years, Gallery North is one of the longest running artists’ cooperative galleries in the nation. It continues its mission to promote and sell local art in the heart of beautiful downtown Edmonds. Gallery North is located at 401 Main Street, Edmonds, WA and is open seven days a week. For further information, please visit the Gallery North website at www.GalleryNorthEdmonds.com or contact the gallery at 425-774-0946.